THE BEST 30 TABLE DECOR IDEAS YOU’LL EVER SEE! 1. Use contrasting patterns to make a bold statement! I know, I know, it can be a little scary placing contrasting patterns together but look how awesome it can look?! As long as you don’t overdo it then patterns can really add an extra dimension to your decor! 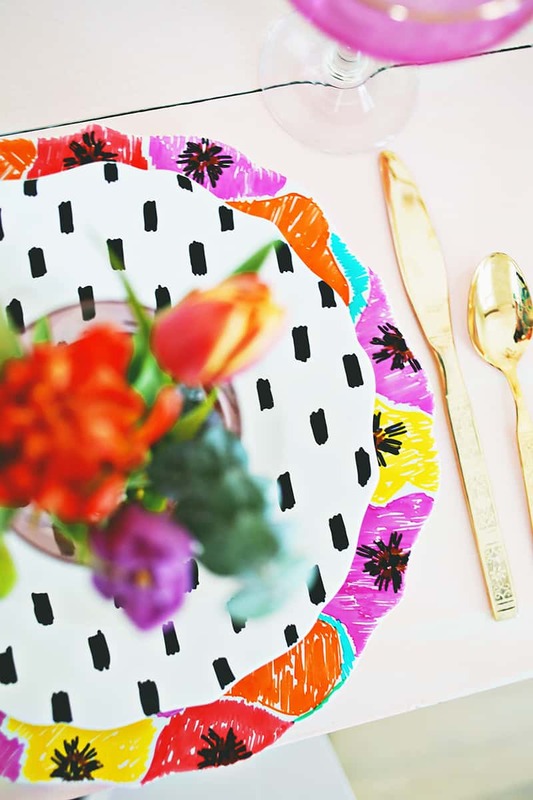 You can see a tutorial for these hand painted plates here but it doesn’t have to just be plates, you could layer patterns with the table cloth, napkins and even place settings! I feel like place mats are often overlooked these days but they really can look super beautiful against a white tablecloth! You can even download these gorgeous brushstroke place mats and print them out! I absolutely love how stylists took the rustic elements of wood and added a pop of colour to them in this styled shoot! By adding bright glittered card to the top or different colour wheels it really modernises the wooden look! 4. Add sparkle with disco balls! You really can’t go wrong with a little sparkle and if you’re a fan of bling bling then disco balls are an epic way to style up your table! Plus you can get them in all sizes so you could even pop some giant ones around the venue! See the full shoot here! If you want to keep the costs down then filling used cans with flowers is a great alternative to small vases! I love the Mexican style cans in this styled shoot but you can always take the labels off and spray paint the cans too! Balloons can sometimes get a bad rep but when done well they can really add a fun and elegant touch to your decor! Instead of placing a bunch in the middle of the table it looks so much better to have them running along the length of your table creating an almost floating table runner! Plus how beautiful are these palm frond balloons?! If you and your other half are fond of travelling then placing a few globes along the table can really bring that theme out! This Amsterdam styled shoot featured lots of little global details like aeroplane place settings, vintage suitcases and plenty of globes! 8. Leave your guests a note! I love the idea of leaving your guests a little message on their place setting that will make them smile! It could be something as simple as ‘You Make Us Happy’ like in this fun geometric shoot! It’s no secret that both me and Emily LOVE Mexico so adding in some Mexican touches to table decor is always a winning situation from us! It could be as simple as a Mexican table runner, using margarita glasses or even having the table names in Spanish! 10. Add some animal antics! Even though this decor was for a children’s birthday party, I love the idea of applying this style to a wedding, especially for animal lovers! Spray painting the animal decor gold really makes the whole thing a lot more classy but still keeps that element of fun! Emily got this terrarium from John Lewis last year but it is very easy to create your own versions using goldfish bowls and bell jars, basically anything glass with a wide enough depth and surface area to plant your succulents in will do just fine and will probably be a lot cheaper too! See the full tutorial here! 12. Go Wild With Colours! When Oh Joy created this shoot with Target it was one of my favourite styled tables I had ever seen! The bright colours all looked so incredible together and super stylish! Creating a beautiful place setting is the perfect place to start when styling your table and you can never go wrong when using flowers! We created these easy concrete test tube place settings last year and they were a huge hit! See the full tutorial here! Did somebody say Hawaiian?! I absolultely adore all of the little details in this bridal shower, from the aloha place settings to the pineapple straws and palm frond cushions! It’s really easy to find loads of cheap plastic skulls around Halloween but add a lick of paint to them and you’ve instantly got something beautiful and classy looking! Painted skulls can look super effective as part of your table decor especially when filled with flowers like in this Spring Style Soiree! We’ve all seen how beautiful honeycombs look when hanging from the ceiling but I think they look even more awesome used as a table runner! Especially when the colours are so bright and bold and the rest of the table is very simple. See the full bridal shower here! Candles can be a really effective way of bulking out the table if you pick different sizes, different colours, shapes and sizes to really vary it up and add different levels to the table decor! It was done really well in this astronomical and industrial shoot! If you’d rather go minimal with the colours then simply pick one shade that you like and pair it with white like in this mod daisy birthday party! It’s such an effective technique and can really make that one colour POP! We’ve already talked about contrasting patterns but if you’d rather keep it simple with one pattern then you’ll love these floral plates teamed with gorgeous gold cutlery! I am SO obsessed with cacti right now and placing them along the table in brightly coloured pots is a great way to breathe life into the decor! This couple did it super well in their wedding! We created a tutorial a while back on creating your own napkins to lay out on the table, you could put anything on them from your initials, a message to your guests or even just a pretty designs! It’s super easy too! Click here for the full DIY. 22. Why not create a balloon centre piece? Who says balloons have to float above you?! I think they look super effective on the table! Especially when they’re not blown up all the way, just different sized balloons in all different colours! See the full tutorial here! 23. Have a pinwheel party! Few things look prettier than pinwheels! I especially love how cute they look placed on top of napkins like in this Mr Magnorium styled shoot! Why should the table runner stop at the end of the table?! How incredible does that foliage table runner look cascading over the table like that! It’s so elegant and beautiful and perfectly flows through to the rest of the room decor! If you don’t fancy using old cans or vases to place your flowers in then why not use fruit? This pineapple vase tutorial is really easy and adds a super summer time feel for your table decor! Instead of using your guests names as place settings why not pop a photo in their place instead? It’s way more personal and even more fun for the other guests to see everyone else’s pictures! See the full tea party here! Get creative with mini mosaic tiles and make your own centrepieces! In this tutorial we covered a skull in little square stickers but you could cover anything from a vase to the outside of plates or around the edges of glasses to add a little more detail to your decor! We don’t often think about using lighting on tables (other than candles) but weaving some fairy lights throughout the decor can look really pretty and effective and create al the magical feels! For a real industrial vibe to your table you could create your own concrete vases using this tutorial! Then you can fill them with flowers, cacti, succulents or whatever you like! Copper and gold are really having a moment right now and adding some gold accents to your decor is super on trend! This can be as simple as using gold cutlery or adding gold flakes or paint to the edges of succulents like in this DIY table runner!